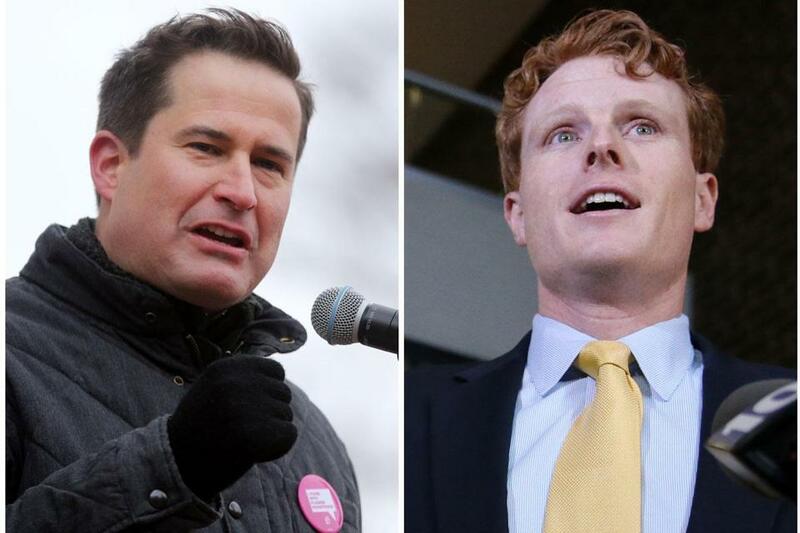 Members of the Massachusetts congressional delegation and other observers say Representatives Seth Moulton (left) and Joe Kennedy have an amicable relationship. WASHINGTON — The two hottest political stars in Massachusetts often seem to be blazing off in different directions. One is descended from Democratic royalty, with his family’s unmistakable big smile, thick hair, and Hyannis Port pedigree. He plays the role of dutiful, loyal team player, groomed for a bright future on the national stage. He is respectful — humble even — and was rewarded by party elders with a national speaking slot after the State of the Union address last week. The other is a brash former Marine captain and Iraq War combat veteran, a renegade, defiantly leading an insurgency against Washington’s old guard Democrats and wearing his national aspirations on his sleeve. He has already been to Iowa, the early presidential caucus state, and is a regular on CNN or MSNBC. So what will happen if these two heavenly bodies collide some day, as many believe they will? Representatives Joe Kennedy III, of Brookline, and Seth Moulton, of Salem, insist there is no rivalry, despite the media’s best efforts to concoct one, and that there is plenty of room for both of them in Massachusetts, a state with a history of producing an abundance of political talent (although no presidential winners since 1960). As for any future conflict, both men insist they are not thinking beyond their current jobs and are focused on fighting the Trump administration. Both lawmakers — and those around them — say there is no competition between them and they get along well. The entire delegation is like a family, said Representative Richard Neal of Springfield, the dean of the Bay State contingent — though others close to the delegation say privately that Moulton is more of an outsider in the group, and his ways sometimes ruffle feathers among his Massachusetts colleagues. In separate interviews with the Globe, the lawmakers had only complimentary things to say about one another, and seemed eager to cite evidence of their personal bond. If they are to be believed, they could star in their own buddy movie. “Look, we’re pretty good friends,” said Kennedy, 37. “There ain’t no rivalry,” echoed Moulton, 39. In fact, Kennedy is the person he turns to most for advice on how to navigate the complexities of life as a member of Congress, particularly the personal side of the job, Moulton said. Most recently, that meant asking Kennedy for advice about the challenges of combining marriage and Congress ahead of Moulton’s September 2017 wedding to Liz Boardman. Kennedy emphasized to him “how difficult this job is on spouses,” then connected his wife, Lauren Burchfield Kennedy, to Moulton’s fiancee so the two women could discuss the hardships as well. Kennedy and his wife attended the wedding in Marblehead. Elected to the House one term before Moulton, Kennedy also helped initiate his junior colleague into a bipartisan workout group led by GOP Representative Markwayne Mullin of Oklahoma, a former professional mixed-martial-arts cage fighter. Kennedy said the birth of his son, just six weeks ago, means Moulton is showing up far more often than he at the 6:30 a.m. sessions, but typically both he and Moulton are regulars. More recently, Moulton said, he was asking Kennedy by text about the government shutdown because Kennedy had been through one before. When asked, both men grumble about the attention they’ve been getting and the stories written about their star status and ambitions. 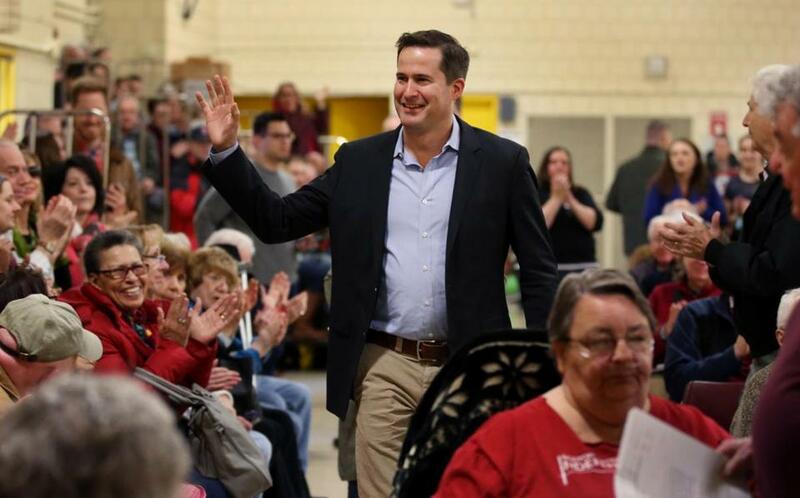 Moulton greeted constituents in April at a town hall meeting. Kennedy and Moulton both said there are other impressive political up-and-comers in the Bay State who deserve the same notice. “If you’re talking about rising stars in the party you’re missing some of the most important stars right here in our own back yard,” Moulton said, pointing to Massachusetts Attorney General Maura Healey, Boston City Council President Michelle Wu, and fellow US House member Katherine Clark of Melrose. Clark has gained national attention for her fight for stronger gun laws and has also been working behind the scenes for the Democrats’ House campaign arm to recruit candidates to help the party take back the House. They are all names Kennedy pointed to as well, making the same point. That’s not going to stop political insiders from playing the “what-if’’ parlor games. Which of the two would run for Senate in 2020, if incumbent Ed Markey, who will be 74 by that election, opts to retire? Would Moulton launch a primary campaign against Markey, boldly taking on an incumbent as he successfully did in 2014 when he stunned the political world and took down North Shore Representative John Tierney? Would establishment Democrats try to make sure the torch got passed to Kennedy? Meanwhile, does the State House beckon to either of them? If Governor Charlie Baker wins reelection, and decides eight years is enough, the corner office would open up in 2022. And then there is the lure of the White House. The nascent Democratic presidential primary in 2020 presently lacks any semblance of a coherent party message or dominant contender. So why not one (or both) of them? Another Kennedy could be just what Democrats need to ignite white Catholic voters in Rust Belt states, some in the party believe. And Moulton, as an Iraq War veteran and more of a political outsider, might match up very well against President Trump, who sat out the war with bone spurs and student deferments, in a one-one-one contest. 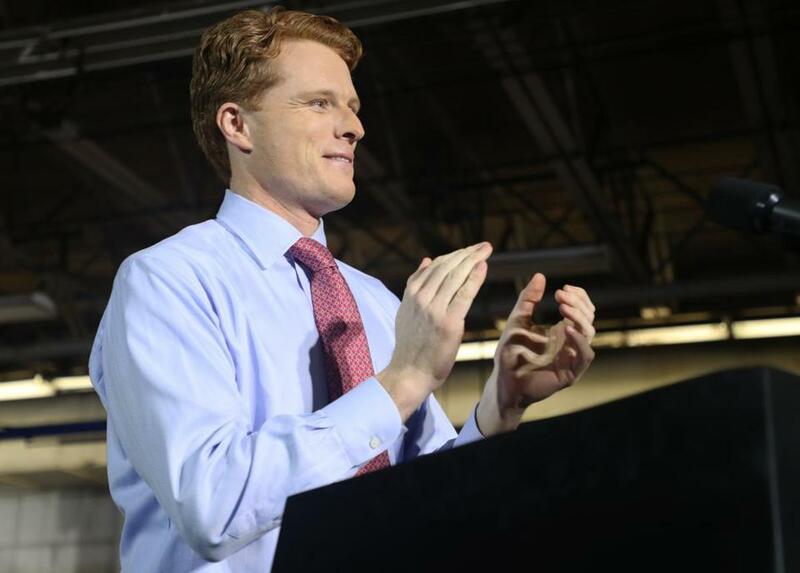 Kennedy’s selection to deliver the official Democratic response to Trump’s State of the Union address last week — and his solid performance marred only by an excessive use of ChapStick — sparked a fresh round of speculative sport about where the redheaded grandson of Bobby Kennedy and son of former representative Joe Kennedy is headed. “Proud to call you a friend, @RepJoeKennedy. You captured the idealism and optimism of our party — and this nation,” tweeted former vice president Joe Biden after the speech. Political advisers who have watched Moulton and Kennedy say it’s a mistake to contrive a horse race between the two. Kennedy has played a careful insider’s game, mostly keeping his head down for his first five years in Congress and being careful not to rest on his famous name, Democratic insiders say. Instead, he’s worked diligently to master a handful of signature policy issues as well as win the respect of his party’s leaders. Kennedy was tapped by Democrats to offer up the official response to President Trump’s State of the Union. Kennedy has really started to raise his profile only over the past year in Washington’s new Trump era. He’s gained notice, in part, through numerous videos of his speeches and committee performances that have attracted millions of views online and brought him the admiration of grass-roots activists. His biggest breakthrough moment nationally came with a minute-long, middle-of-the-night speech criticizing the GOP bill to repeal the Barack Obama health care bill as “an act of malice,” the video of which was seen more than 10 million times on Facebook alone. House minority leader Nancy Pelosi was in charge of picking the person to deliver the official response to the State of the Union. The choice of Kennedy, a Pelosi loyalist, was a clear signal of what she and other members have in mind for him. That’s a stark contrast to Moulton, who solidified his insurgent brand by loudly campaigning for the end of Pelosi’s reign as top House Democratic leader in the aftermath of the 2016 election. This has not earned him any love within Pelosi’s circle. Others believe he may have he hurt his political prospects by burning bridges with party leadership. “I think it’s a smart move on his part. A lot of people outside the D.C. bubble want to see things done differently,” said Doug Rubin, a Democratic campaign strategist who helped Kennedy win his first congressional race. Still, many feel Moulton wears his ambition a little too openly, eagerly running to the cameras to talk about the hot issue of the day, keen to get credit for whatever initiative he is pursuing. Many Democrats consider it an open secret that Moulton wants to run for Markey’s Senate seat, whether or not Markey decides to run again in 2020. At least, that was the case, until all the presidential chatter began. While his critics call him self-serving and opportunistic, Moulton’s supporters say his actions and outspokenness are driven by a genuine desire to serve his country, not further his own political prospects. “I get why people can by cynical,” given what they’ve come to expect from their politicians, said Emily Cherniack, who helped recruit Moulton to run in 2014 and founded New Politics, which assists candidates with backgrounds in public service. “And Seth, he’s like Captain America, and so people are like, ‘There has to be something wrong with him. . . . There’s got to be some ulterior motive there.’ And it’s actually not that complicated. It is about service, which I think people find hard to believe,” Cherniack said. There’s also a not-insignificant difference in political experience levels between Kennedy — who grew up in the business, a scion of political royalty — and Moulton that some see at play. In Moulton, she sees a raw, appealing political talent still learning how to define himself. “Seth is still trying to find his footing, find his voice, because he’s still new to politics,” she said.